In the immediate past, telephone lines were the only means to connect with the World Wide Web. With the advancement of technology we are being provided with better options. For instance, now we have got wireless or DSL based broadband connections that offer a great deal of browsing / net processing speed so much so that we can watch streaming media live. A broadband connection is a great innovation; it offers an internet speed ranging from 64 KB / sec to 2 MB / sec which is immensely great as compared to 56 kb / sec of a dial-up one. Most interesting breakthrough is that both broadband connections, DSL & ADSL operate on usual telephone line, BUT, without engaging it. The above achievement has been made possible by attaining a condition in network connectivity such that whether a subscriber is tuned to digital or analog signals telephones; it doesn’t affect the phonic signals. If faster connections are stable as well? A faster connection does not guarantee a stable one. Very often you see that the prescribed speed @ 1 MB / sec is not actually delivered to you, rather there is a fluctuation; this is not that there is something wrong with your system or router, the discrepancy lies in the court of your I. S. P. (Internet Service Provider). It is to be considered here that the stream of digital signal carrying data is not stable like that of a light ray displaying a consistent flow. There is always some fluctuation in data traveling. What causes a sudden disconnection? 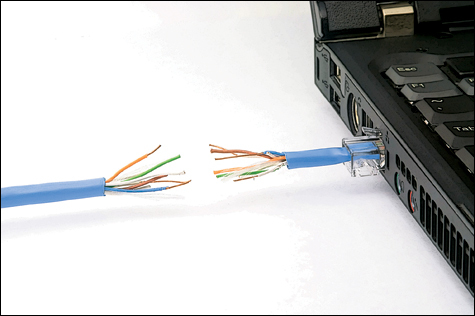 There are numerous causes for the slower working of your internet connection. One of the major causes is your ISP’s set up. It is their obligation to provide you services commensurate with the amount you pay to them by incorporating up-to-date technologies to their set up as per contemporary demand. In other words, they should arrange all the essential electronic accessories and the technical assistance that could help them effectively handle large amounts of data transfer at a faster rate. Next comes the hardware you are operating to receive all those bits sent by your ISP — is it thoroughly compatible with the existing systems of the domain. Before configuring a network connection on your PC, you must be conscious about the compatibility of interface cards and modem / routers etc. Common NICs are Ethernet, IEEE 802.3 with a set of compatible routers, wired or wireless, are recommended. It should be a common practice to first of all check local connections, if there is a network freeze or disconnection. The status of LAN can be very easily verified by double clicking the computers’ icon usually located at right bottom of your PC screen in the system’s tray. The dialogue box that opens in response to the clicking offers you to set / repair the connection. Regarding the bit transfer rate, this you can easily watch by just dragging your mouse pointer to the icon. Examine your NIC card and ensure that it is not tuned to power save setting mode, which disables the card for the time being in idle hours. Turn off power save mode by accessing Device Manager and pointing on the relevant network adapter. Now deselect the option displaying “Allow the computer to turn off this device to save power”. Now turn off wake-on-LAN setting by inactivating the option: “Allow this device to bring the computer out of standby”. This may drain out your PC’s battery, if it’s there, and configure your PC to refresh its settings periodically. After the settings are done, check the performance / tuning of your router. Watch if the LED lights are blinking as usual. Ensure that the plugs and cables are firmly intact in their respective slots in a spark free arrangement. Once you have established that your local settings and connections are ‘OK’, the final option left with you is to contact your Internet Service Provider to ascertain the synchronization of your router with the ISP’s hub because this is the high time to contact company’s technical support representative for necessary assistance.